The ancient Greeks chewed mastiche – a chewing gum made from the resin of the mastic tree. 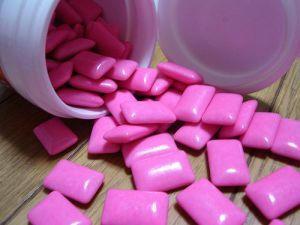 Thomas Adams first tried to change chicle into automobile tires, before inventing a chewing gum that tasted good. In 1848 John B. Curtis developed and sold the first commerical chewing gum called The State of Maine Pure Spruce Gum. On December 28 1869, William Finley Semple became the first person to patent a chewing gum – U.S patent #98,304. By 1888, an Adams’ chewing gum called Tutti-Frutti became the first chew to be sold in a vending machine. The machines were located in a New York City subway station. The very first bubble gum was invented by Frank Henry Fleer in 1906. He called it Blibber-Blubber. Fleer’s recipe was later perfected by Walter Diemer, who called his product Double Bubble. http://www.thatsmygum.com Find every piece of gum you’ve ever spit out. nice description on the history of chewing gum. i love the wriggly chewing gum except after its lost its taste. What is 15 + 2 ?